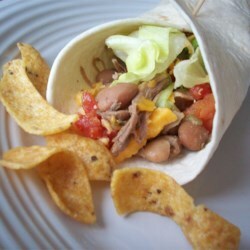 Slow Cooker Pork Chalupas: My husband’s grandmother introduced us to this recipe years ago but I just got brave enough to try it myself. Turns out, it’s a cinch! If you’re feeding a crowd, this is a great recipe to try. In addition to the ingredients in this recipe, you’ll need your favorite toppings for tacos: cheese, sour cream, salsa, whatever else you like. We usually serve the chalupa meat on a bed of lettuce and Fritos instead of on taco shells. Add a side of fruit salad or corn on the cob and your meal is complete. Epic Fish Tacos: Yes, we’re big on tacos around here, but these are not just any tacos. Their name is not an exaggeration; they are epic, indeed. I didn’t change a single thing in this recipe in the three times I’ve made it, and it’s always perfect. It’s pretty easy, too! The only downside for us is our kids aren’t big on fish. As in, they won’t touch it with a foot-long fork. But, since we love tacos, we generally have some type of taco meet or quesadilla leftovers that they eat while we enjoy the epic-ness. Honey-Ginger Chicken Bites: This recipe was touted as “great for kids,” but our whole family enjoyed it. I’ve tried many recipes for Asian type chicken (sesame chicken, teriyaki chicken, etc. ), but this is the only one that turned out a little crispy on the outside instead of soggy. We had it with rice and green beans. Pumpkin Chocolate Chip Muffins: These are our muffins of choice right now. The recipe comes from the first blog I ever followed, moneysavingmom.com. It’s delicious, and can be nutritious, with a few tweaks. The recipe makes a lot, so I have enough to go with dinner or serve as a breakfast, and then make some mini-muffins for snacks later on. Easy Lemon Chicken: This is the recipe I’m trying out tonight. I’m risking the crock pot, even though the blog I’ve linked to here says it’s not the best way to make this chicken. But I chose the recipe for the fact that it’s a slow cooker recipe, and I’ve been told that it works great by a cook I trust. After re-reading the recipe, I’m a little concerned that I didn’t use enough butter. Perhaps I’ll go chunk in a few more “cubes” right now. Fingers crossed!